An Anderson church has opened its doors to homeless people who need to get out of dangerously cold temperatures. ANDERSON — It's not a big shelter, but it's an important one for the homeless in Anderson. 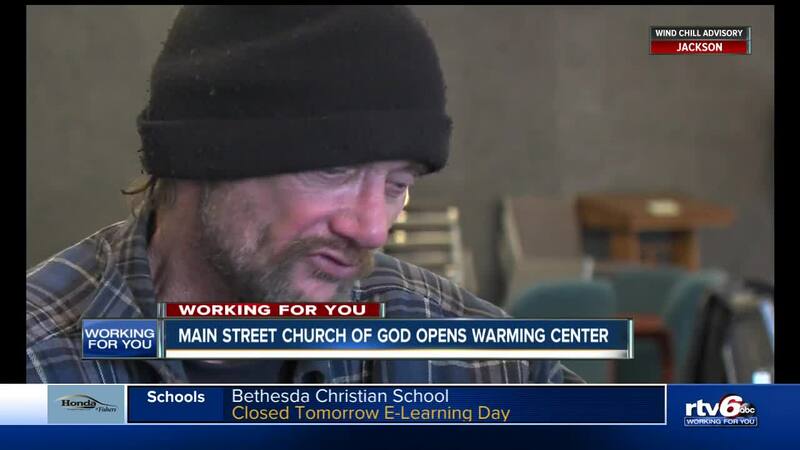 Main Street Church of God has opened its doors until Friday at noon, offering a warm place during bitter cold weather. The are 25 beds at the church and they are a welcome site for people like 32-year-old Edwin Roman who has been living on the street. "Survive, survive, by any means." said Roman. At the Main Street Church of God, Roman has his own cot and three meals. So does 58-year-old Roger McDonald who is trying to forget what it's like braving the temperatures in a tent. "It was really very, very cold last night, " he said. "It got down pretty chilly this morning. I'm definitely not going to survive if I stay out there tonight." The shelter is a volunteer effort, both adults and children take part. "It's what we are called to do," said Pastor Don Billey. "We are called to show compassion. We are called to show the love of God. We do that by knowing the needs of the community. Right now there is an urgent need. It is something we can do. We've got a facility." 68-year-old Dave Pettigrew is not homeless -- he lives on a farm, but decided to seek shelter in the city. "These temps are historically low. Living in a rural area by myself, if the power went off, I'd be in deep trouble," said Pettigrew. There's also a warming center at Anderson's St. Vincent Hospital. It is open from 8pm to 8am.